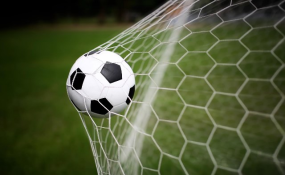 A soccer ball in the net (file photo). Three -time champions Nigeria made a return to the biggest football party in Africa after being held to a 1-1 draw by South Africa in Johannesburg yesterday. The result meant only one other team in Gourp E (either Libya or South Africa) could end up with the same 10 points that Nigeria already have, by the end of the qualification series in March 2019. Libya's 8-1 defeat of their hosts Seychelles on Mahé Island would create real fear in the Bafana Bafana going into that last battle against the Mediterranean Knights in Tunisia. The South Africans need a draw from that match to qualify but Libya will go through with a win. Nigeria made the brighter start in yesterday's match at the FNB Stadium with stand -in Captain Ahmed Musa watching his shot held by goalkeeper Itumeleng Khune in the 6th minute. Two minutes later, Nigeria had the ball in the net after a sweet combination by Musa and Kelechi Iheanacho. But Gambian Referee Papa Gassama wrongly ruled it off-side, on the prompting of the assistant referee. A minute later, Nigeria finally went in front as Samuel Kalu, playing in a wing back role, outpaced Sfiso Hlanti and crossed, only for Buhle Mkhwanazi to divert it past Khune into the net for an own-goal. In the 11th minute, Bafana had a glorious chance to equalize as the irrepressible Percy Tau got behind the Nigerian defence, only to be thwarted by Kalu. It became a ding-dong affair as the match gathered some vibrancy, with Captain Thulani Hlatshwayo arriving late for a free -kick and Mothiba wrong -footed, and at the other end, William Ekong's run to a good chance from a corner was foiled and Kalu shot too high from an Ahmed Musa corner. Bafana were level in the 26th minute though, as the nimble -footed Tau, appropriately named Man-of-the-Match, left Ekong and Omeruo in no-man's-land before passing to Mothiba to slot into an empty net. Nigeria could have reclaimed leadership in the 36th minute, but after Musa did all the work, Iheanacho's atrocious first touch bungled the opportunity. In the second half, both teams sought to conserve energy in a high altitude environment. Then in the 83rd minute, another big talking point surfaced when Musa ran onto a great pass and slotted past Khune, only to be wrongly deemed off-side. However, the mistakes by the officials didn't prove costly as the Eagles went on to earn the point that qualifies them for next year's Nations Cup holding in Cameroon. After missing the last two AFCON finals, Nigeria will now join hosts Cameroon, Madagascar, Senegal, Tunisia, Egypt, Morocco and Uganda as the teams already guaranteed slots at next year's competition. An ecstatic President of the Nigeria Football Federation, Mr. Amaju Melvin Pinnick heaped encomiums on Nigeria's President Muhammadu Buhari and the Federal Government for providing the conducive environment for Nigerian football to continue to thrive, while praising specially Governor Simon Bako Lalong of Plateau State who led the Nigeria delegation to the big match. "This is great day for Nigerian Football. Just as it happened in the qualifying series for the FIFA World Cup, we have won the ticket to the AFCON with a match to spare. This victory is for President Muhammadu Buhari and the Government and people of Nigeria. "We commend the technical crew and the players, and I must praise Governor Simon Lalong who is here with his wife to support the team. He has been a pillar of support. I also congratulate the Members of the NFF Executive Committee, NFF Management and Staff, Members of the NFF Congress, Football Stakeholders and the media. "We will begin the preparations for the AFCON immediately. As I have said several times, we do not want the AFCON ticket just to go there and make up the number, but to make a massive impact at the finals," said Pinnick, who is also the President of the AFCON Organizing Committee, aside being the 1st Vice President of the Confederation of African Football. The Super Eagles have a friendly international with the Cranes of Uganda at the Stephen Keshi Stadium, Asaba, on Tuesday evening.